Settling, establishing settlements, is one of the fundamental anthropological constants. Conducting research into human settlements has thus occupied disciplines ranging from protohistory to urban sociology. 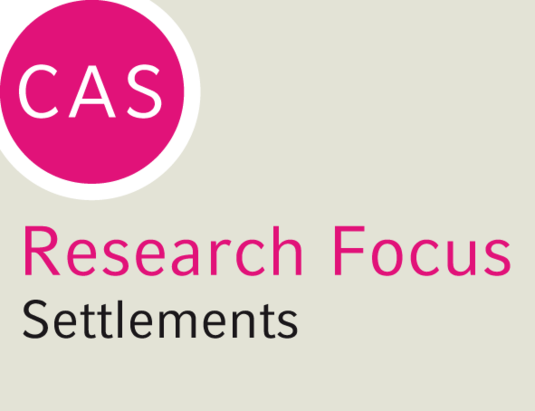 In order to do justice to this immense spectrum, the CAS research focus aims to approach the subject on two overlapping and complementary levels: on the first level, settlements from ancient contexts are in the foreground, with impulses coming from the historical and archaeological disciplines. In the formation of ancient settlements, there are significant common structural elements which allowed, for example, an inhabitant of a provincial city during the Assyrian period in what is now Israel to navigate his way successfully around the capital city Ninive and understand the urban space. Modern research on ancient settlements has thus often identified characteristic formation patterns of settlements and cities, referring to the generally common building types such as city gates, forums and temple precincts. In contrast to this is the great diversity stretching across the ages: despite supra-regional commonalities, the contemporary traveler was immediately struck by the sharp differences between the sites visited. Settlements and the descriptions thereof thus exist within the spectrum of diversity and homogeneity – a characteristic which is also relevant for current urban sociology. The second level hence examines the topic of settlements from a broader chronological perspective. The focus will be on the question of supra-temporal phenomena on the one hand, while on the other hand, the inclusion of the discipline of ethnology is aimed at bringing current forms of cities and settlements into the debate. One example of this extension is the subject of "Lost Cities": partly or entirely deserted cities were a widespread phenomenon and typical of many eras from archaic times up to late antiquity. Today, examples such as the decline of the city of Detroit or the destruction of the earthquake-hit city of Christchurch will be examined. The question arises here as to which locations are settled by humans – without being deterred by dangerous environmental conditions - and for what reasons. Prof. Jennifer R. Pournelle, Ph.D.
Lecture by Prof. Jennifer R. Pournelle, Ph.D. – "First Cities. Early Urban Development and Urban Sustainability in Southern Iraq"
Lecture by Dr. Julia Sattler – "The Price of Progress: Narrating the Fall of Industrial Cities"
International Conference – "Between Local and Translocal: Founding, Inhabiting and Appropriating Settlements"
Lecture by Prof. Dr. Klaus-G. Hinzen – "Elements of a Quantitative Archaeoseismological Study"
Afternoon-Workshop – "Die Stadt am Tropf: Ursprung und Krise von Outsourcing"
Lecture by Prof. Dipl.-Ing. Markus Allmann und Prof. Dr. Elisa T. Bertuzzo – "Zukunft des Wohnens – Wohnen in der Zukunft. Future Houses und neue Mobilität"
Lecture by Dr. Kirsten Bos – "Sickness and Sedentism: An Ecological Approach to Disease Transmission"
Conference – "Abandoned Settlements: Discontinuity and Identity"